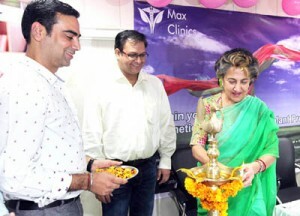 Max Clinics, the largest super-specialty OPD network in North India, today launched its much awaited Cosmetic,Laser and Hair transplant services at Gandhi Nagar Jammu. Regular Plastic/Cosmetic, Laser and Hair transplant OPD will be run on third Sunday of every month at Max Clinics, opposite Peer Baba, Gole Market, Gandhi Nagar Jammu, informed Parvez Ahmed Beigh, General Manager (Admin) at Max Clinics. On the occasion, free consultation was provided to all the customers and patients. MLC Rani Blowria, who was chief guest on the occasion, said that the concept of cosmetic surgery to enhance looks was becoming increasingly accepted in society. It is encouraging that more people seemed to be consulting a trained specialist before opting for surgery as advances in technology have contributed a lot to growing popularity of cosmetic surgery,” she said and added that people were feeling young and perhaps more are opting to look young as well. According to Dr Paryesh Gupta, Chief Plastic, Microvescular and Hair Transplant Surgeon, hair loss can be emotionally debilitating as it isolates the affected person and makes him/her go deep within self. You feel alienated from your friends and family as you feel violated and anxious, unable to openly discuss your feelings surrounding it, he added. Hair loss is one of the most common grievances amongst men and can affect about 40 percent of women, a recent survey revealed that 47 percent of hair loss sufferers would spend their life savings to regain a full head. Anil Choudhary, Manager Brand Promotion and Public Relations, said that Regular Ortho Joint Replacement, Cardiology and Cardiac Thoracic Surgery OPDs are also serving the people of J&K at Max Clinics Jammu.